Know your history. Embrace your letters. Above: From left to right - Hosea Williams (Phi Beta Sigma), Jesse Jackson (Omega Psi Phi), Martin Luther King, Jr. (Alpha Phi Alpha), Ralph Abernathy (Kappa Alpha Psi). 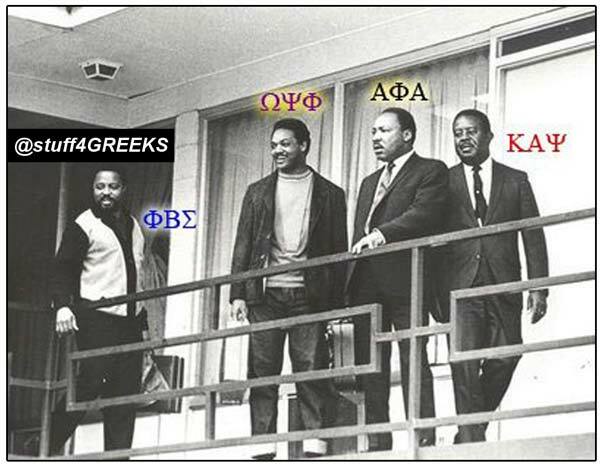 All members of all fraternities and sororities should know and embrace the significance of this photo. It was taken at the Lorraine Hotel in Memphis, Tennessee, the day before Dr. King was assassinated in April 1968. Greek life is more than just letters, colors, and parties... but often times, the general public does not understand this. The media tends to paint a negative picture of Greeks by focusing on stories of brutal hazing and binge drinking. To combat this negativity, wear your letters with pride and show people through your service that Greeks make a difference and bring about positive change in the world. Today our nation celebrates the life of Rev. Dr. Martin Luther King, Jr. We must honor and keep his dream alive not just today, but every day. Note: Several people have asked if they can buy a poster of the above photo. We have historically said "no" to this request, but due to the recent government shutdown, posters are available here for a limited time, and ALL of the profits are donated to The King Center in Atlanta. Ships in 1-6 business days.